During the battle between republicans and monarchists in Mexico the native lands of the Austrian Emperor Maximilian and his Belgian bride Empress Carlota sent volunteers to help. The Belgian Legion consisted of a battalion of light infantry and a battalion of grenadiers under Lt. Col. Baron Alfred van der Smissen. After Carlota celebrated her guards in Mexico City the Belgians were sent to the state of Michoacan to reinforce the 81st French Regiment. 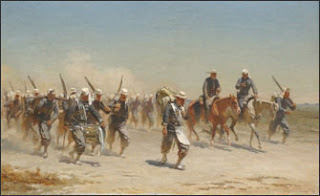 When word came that the Mexican republican General Corona Regules was marching on the state capital of Morelia with 3,000 men Colonel van der Smissen was ordered to send 300 of his troops to hold the village of Tacambaro under Major Emile Tigdal. It would prove to be a grave mistake on the part of the French high command as Tigdal and his 300 Belgians would be right in the path of the Mexican republicans who outnumbered them 10 to 1. Nonetheless, the Belgians entrenched themselves around Tacambaro and prepared to fight. On April 11, 1865 Regules attacked with vastly superior numbers and having the Belgians practically surrounded. Showing incredible courage and tenacity they threw back repeated republican attacks and on 3 occasions even launched counter-attacks by bayonet. After fierce fighting for four hours the republicans halted and the Belgians fell back to the main plaza in Tacambaro and barricaded themselves inside the church. Major Tigdal, Captain Chazal and 3 lieutenants were dead and all the officers had been killed or wounded but the Belgian troops stubbornly fought on. The republicans closed in and attacked again and again until the Belgians had been reduced from their original strength of 300 to only 190 men. Finally, the Mexican republicans set fire to the church and the Belgian survivors were forced to surrender. At that point the republican General Jose Arteaga arrived to take over command. Against the protests of Regules he ordered the Belgian survivors to be stood up against the wall of the church and shot. The battle caused outrage across two continents and later Colonel van der Smissen and Mexican Imperial Army General Ramon Mendez returned to Tacambaro and avenged their earlier defeat. It had been a loss but it had also been a magnificent display of the courage, heroism and determination of the Belgian troops fighting in the service of their princess, the Empress of Mexico, in the war against republican revolutionaries. Viva Carlota y recuerden Tacambaro! Yes, great post. I wish there was more of a memorial for the brave soldiers at Tacambaro. There are two monuments in Belgium but practically nothing in Mexico. There is just a little plaque in the main plaza by the church. On their last visit Crown Princess Mathilde posed for a photograph under the big portrait of Empress Charlotte in Castle Chapultapec. Thank you for commemorating the brave Belgian fighters. I have great admiration for Belgium and here we have another example how bravely they fought against all odds.